The latest additions to the Microsoft Surface Family have arrived, with the updated Surface Pro 6 and Surface Laptop 2 both having far better specs – and they are cheaper too! Microsoft’s Surface Pro 6 is fast and light, the perfect hybrid tablet that can work just as well as an ultra-portable laptop with its keyboard cover. Featuring 8th Generation processors, redesigned features and updated accessories, the Surface Pro 6 is the first to have a quad-core processor in a massive power upgrade. Microsoft also claims it has a 13-hour battery life, which is a big improvement on its predecessor. Whilst this upgrade wasn’t quite what many of us were hoping for – it still doesn’t feature a USB-C port – it’s still a great option if you’re looking for an ultra-portable PC. And now it comes in a sleek matte black too! It’s important to note that the Surface Pro 6 has two versions – the consumer version which is available on the Microsoft Store and has Windows 10 Home, and the ‘For Business’ version, which is available to lease from HardSoft, which features enhanced swap out warranty, faster CPU equivalents, and Windows 10 Professional. The business versions available to lease from HardSoft are shipped ready to go with Office 365 preinstalled, you just have to pop in your username/password and away you go. Microsoft’s Surface Laptop 2 breaks from innovation in favour of a more traditional ‘Laptop’ user-experience. Much like the Surface Pro 6, not a lot has changed from the original Surface Laptop but the upgraded 8th Generation quad-core processor gives it a power boost, available with up to 1TB of SSD storage and 16GM of RAM. The new black option makes it more attractive than its predecessor too. The Alcantara covered keyboard remains a big feature of the Surface Laptop 2, giving it a top-end feel and, some say, the smell of a new car – if that’s your thing! 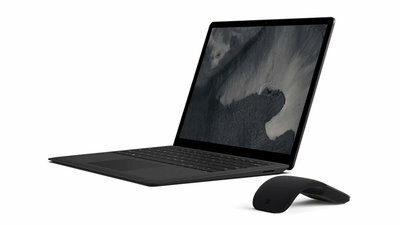 As with the new Surface Pro 6, the Surface Laptop 2 comes in two versions for home and business users. The business option includes the same enhanced swap out warranty, faster CPU equivalents, and Windows 10 Professional and it’s this version of the Surface Laptop 2 which is available to lease from HardSoft. Both the Surface Pro 6 for Business and the Surface Laptop 2 for Business are available from HardSoft on our Flexi-Lease, with 3 years warranty and telephone technical support included. If you’d like to find out more about leasing from HardSoft, get in touch with the team on 020 7111 1643 or sales@hardsoft.co.uk. You can also live chat with the team using the chat feature on the bottom right of our website. It’s easy and affordable to have access to the latest IT for your business. We have been providing leasing of new Apple Mac’s, PCs and Servers to businesses for 30 years. Choose a ‘Flexi-Lease’ and get the options to Renew when you need to or take the big discount with our ‘Pure-Rental’ leasing. With free warranty and support throughout your lease.It’s all easy with e-sign paperwork and fast delivery for both new & established businesses. Computer leasing is more cost effective than purchasing with additional benefits brought to you by Hardsoft™. Hire your computer equipment with us today. This should be expanded on desktop (>768px) only. This should be expanded on mobile (<=768px) only.